The enhanced classic Start menu is going to make a comeback in Windows 8.1, as confirmed by Microsoft at its Build developer conference in California early April 2014. In fact, Terry Myerson, the head of Microsoft’s Operating System division demoed the “new” Start menu to the audience during the conference. The new Start menu for Windows 8 has familiar look and feel with the classic Start menu of Windows 7 and Windows XP, with enhanced support for Windows Store apps and Windows 8 specific user interface elements. 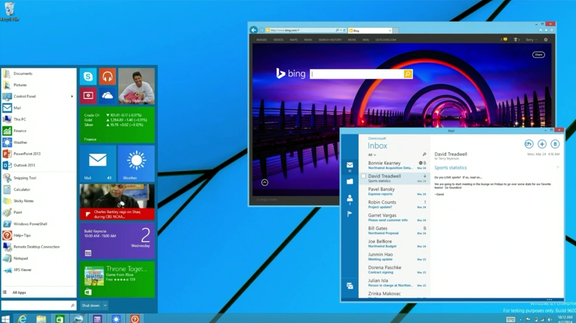 Windows 8 Metro apps can appear together with the desktop apps in the Start menu. In addition, Windows 8’s live tiles which present updates from the Windows 8 Modern apps are now supported in the Start menu too. In addition, future update will also allow user to run Windows Store apps in a window on desktop, much like how a traditional desktop program runs currently. Windows 8.1 Update in Spring 2014 has already added a minimize and close button to the Windows Store apps to make them work much more similar to desktop apps. Many Windows users have been irked by the ‘disappearance’ of Start menu after upgrading or switching to Windows 8, which is meant to better position Windows to fight in touchscreen tablet landscape, such as with iPad and Android-based tablets. But the initial Windows 8 design does not work well with mouse and keyboard, which are used by majority of Windows users. As the result, many turns to third-party solutions which bring back some kind of Start menu, albeit not natively.